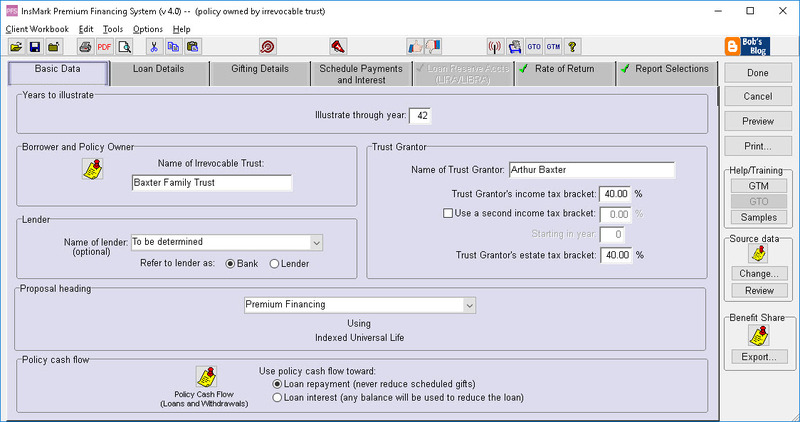 This System illustrates third-party financed life insurance owned by an individual, a company, or an irrevocable life insurance trust using any policy form desired. It also includes an illustration module in which the income tax on an executive bonus (used to purchase life insurance) is funded via third-party financing. The option to use some gifts -- particularly gifts within the annual exclusions and exemptions available -- is useful when you are dealing with an illustration with accrued loan interest in which the cumulative loan is projected to be uncomfortably close the collateral for the loan. With the tightened credit markets, the option to use gifts for premium for the first two or three years, means that plans can get funded now, and when bank loans begin, the cash value frequently will remain well in excess of the cumulative loans -- even when loan interest is accrued. 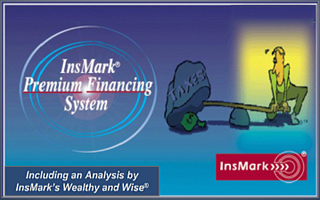 With InsMark’s Premium Financing illustration, data can be imported into InsMark’s Wealthy and Wise® System where it can be compared using “don’t-do-it” versus “do-it” logic. The don’t-do-it analysis involves a projection of Net Worth and Wealth to Heirs without regard to the Premium Financing. The do-it analysis involves re-projecting Net Worth and Wealth to Heirs including the premium financing data. Rather than presenting the Premium Financing illustration as an isolated transaction, by comparing its impact on Net Worth and Wealth to Heirs within Wealthy and Wise®, clients can review an integrated analysis of its powerful results. Note: The effect of InsMark’s Premium Financing illustrations funded partly with gifts in excess of the available annual exclusions and exemptions can also be analyzed for its effectiveness within Wealthy and Wise®. All premiums are paid via bank loan or part paid by bank loan and part paid by the policy owner. Note: An individually owned policy funded by a bank loan arranged by the business produces a dynamic executive benefit.